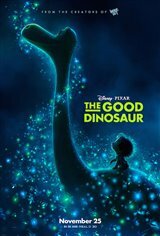 In an alternate world where dinosaurs never became extinct, a young Apatosaurus named Arlo is born to a loving father and mother. Along with his sister and brother, he works on the farm, growing crops. When something keeps breaking into their silo and eating the corn, Arlo's father sets a trap and catches a dog-like little boy. Arlo is tasked with getting rid of the boy, but when the boy gets away, Arlo chases him and they both wind up lost. Afraid, Arlo and the little boy creature, whom he names Spot, team up to find their way home.